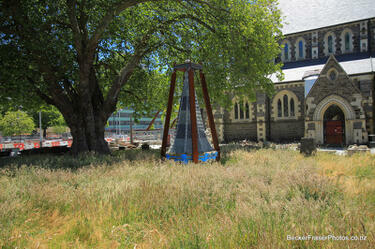 A photograph captioned by BeckerFraserPhotos, "The Christ Church Cathedral looks uncharacteristically unkempt". 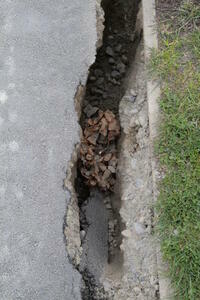 A photograph of a large crack between the pavement and the grass on Gayhurst Road. 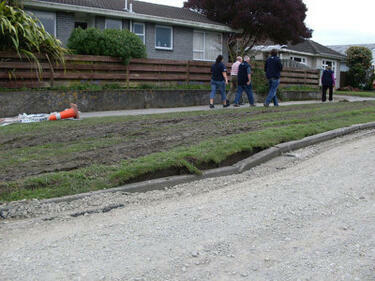 Liquefaction and buckled tarmac on a residential street in North New Brighton. 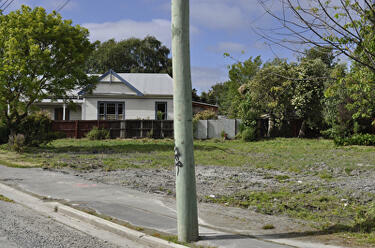 The photographer comments, "In the February 2011 earthquake in Christchurch the kerb at the end of my road was pushed from both ends. This caused it to move away from the grass verge and push itself under the tarmac. 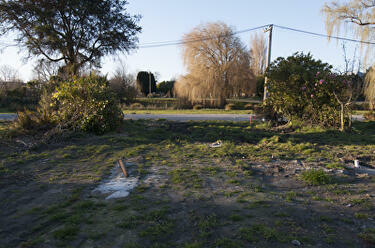 The tarmac would normally have been 3 inches below the top of the kerb. 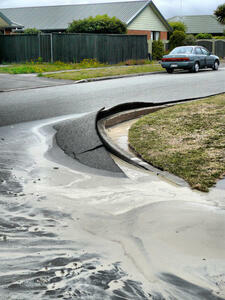 Between the kerb and the grass can be seen the colour of the liquefaction that spewed out from the ground. 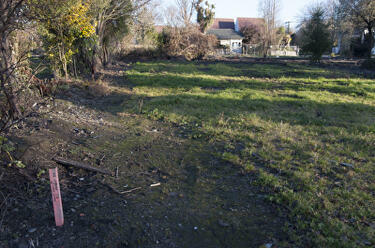 The tarmac in the area seemed to flow downhill". 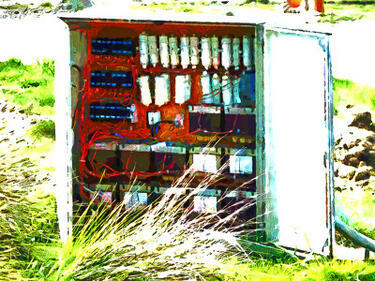 A digitally manipulated image of a fuse box. The photographer comments, "This is a fuse box that was in the middle of a field whilst the nearby stadium building was being demolished". 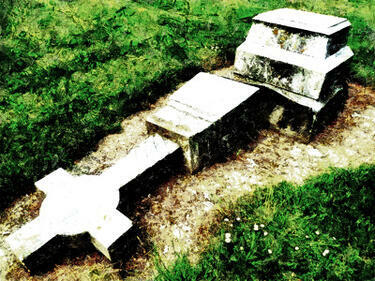 A digitally manipulated image of a fallen headstone. The photographer comments, "Since the September 2010 earthquake in Christchurch, New Zealand a lot of the headstones have fallen, but sadly a lot have not been resurrected to their former places". 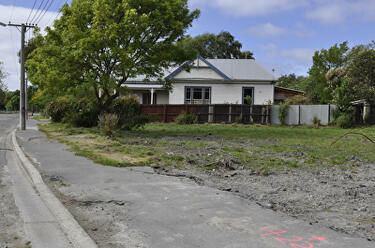 A photograph of the earthquake damage to the curb of a street in Christchurch. The curb has cracked in two places and slumped, exposing the earth beneath the grass turf. A photograph of the house at 468 Oxford Terrace. 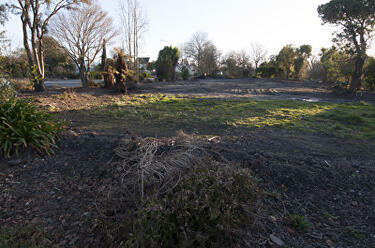 The grass has been mowed but the dead grass has not been removed. 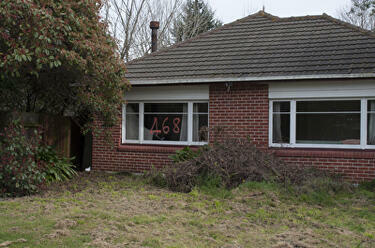 The house number has been spray-painted on one of the windows. 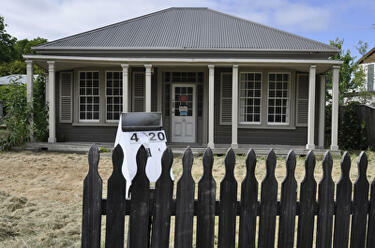 A photograph of the house at 402 Oxford Terrace. 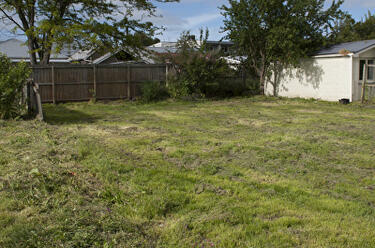 The grass has been mowed, but the dead grass has not been removed. 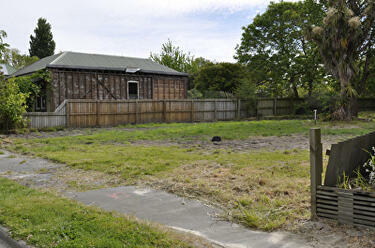 A red sticker on the door indicates that the house in unsafe to enter. 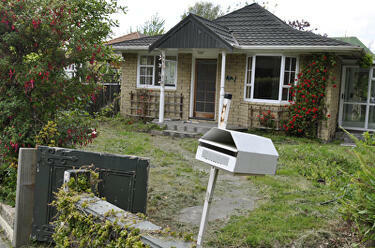 In the foreground, the letterbox is sitting on an angle. A photograph of the house at 410 Oxford Terrace. 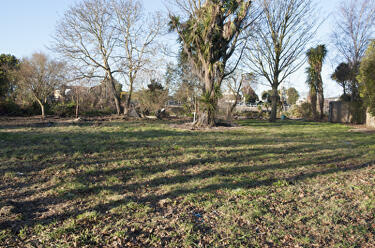 The grass has been mowed but the dead grass has not been removed. A photograph of Robin Duff's house at 386 Oxford Terrace. 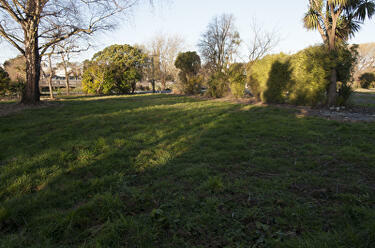 Weeds have grown near the fence and the grass has not been mowed. 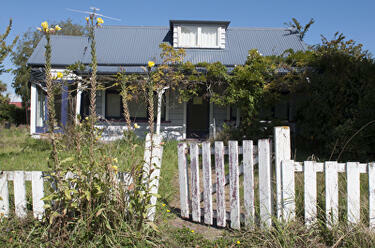 A yellow sticker on the door indicates that access to the house is restricted. 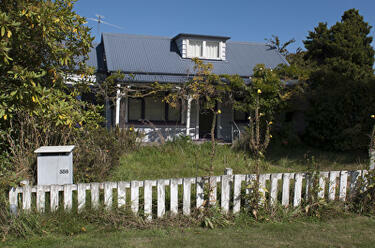 A photograph of Robin Duff's house at 386 Oxford Terrace. Weeds have grown near the fence and the grass has not been mowed. A yellow sticker on the door indicates that the access to the house is restricted.